An instrumental live recording from March 1981, featuring the best live version of Entropy and alternative versions of all of the songs from Live at the Target. 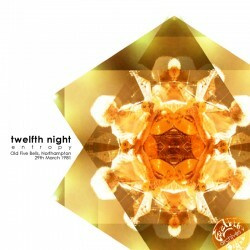 March 1981 was a promising time for Twelfth Night. To promote the Live At The Target album the band set off on an intensive 11-week tour across the south of England. The 35 concerts included the group’s first appearance at The Marquee (as a three-piece as Andy had gone down with pneumonia the day before! ), opening for established acts like Saga and Atomic Rooster, and performing in towns hitherto unexposed to the Twelfth Night live experience. Northampton’s Old Five Bells was representative of the shows at that time: instrumental material drawn from the ‘Target’ LP and the second tape album, and new material that was being almost constantly adapted and rearranged. One such piece, ‘Entropy’, had been around in various forms since the earliest days of the band; a veritable melting pot of ideas. Some parts may be familiar, having been taken from older compositions, or re-used in future ones, but the version presented here for the first time on CD is the final incarnation of the whole piece. One indication of its somewhat unusual status is that it was played under at least 5 other names at various times inc. ‘Four & Three’, ‘Possibly a Paradox’, ‘The Battle of Budapest’ and ‘Selina’!